This trip will satisfy anyone with a taste for adventure. Cinque Terre is famous for its beautiful coastline and picturesque villages. The ancient system of footpaths and trails were for centuries the only land link with the outside world. It is debated whether the finest coastal walk in Europe is from Vernazza to Corniglia or from Corniglia to Vernazza. We include the entire classic coastal path that entails visits to small villages clinging to rock buttresses or the sides of steep ravines. This route takes you along the ancient Etruscan trade route with an endless variety of walks. 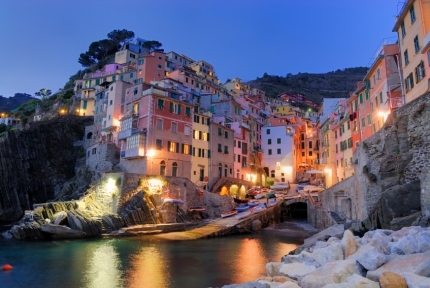 The Cinque Terre is undoubtedly the most picturesque coastline in Europe. This hike offers a great combination of fine weather, palm trees, medieval villages, gastronomic cuisine and fine wines. On an independent holiday you can explore the Cinque Terre at liberty, walking along quiet roads through changing scenery. These holidays offer all the pleasures of hiking point to point, arriving at a new destination each day, without the hassle of carrying any luggage. Distances each day are moderate, allowing you to walk at your own pace and enjoy the countryside. Our detailed route notes, up-to-date maps, together with the official marker posts, will ensure that you can enjoy your holiday without worrying about finding the routes.